Recently, a business development effort in the Greater Mankato area was written up by Downtown Development Center. Downtown Development Center is a 50+-year-old organization focused on serving as a clearinghouse on practical strategies and tactics for revitalizing the hearts of cities. A few months ago, a representative from the Minneapolis Federal Reserve Bank visited Greater Mankato and met with several business and community leaders on the state of the community. The result is a great community profile that was just published in their fedgazette. The article, titled District Spotlight: Mankato finds its big-city legs highlights how we’ve emerged as a top regional center in the upper Midwest and is worth a read and share to your colleges. Thanks to those who met with the Federal Reserve Representative and to all of you for making our community great! Keep the momentum going! Where to start? Being invited as a Special Guest to the State of the Union by one’s sitting Congressman … my goodness. Just as the community is growing, so is our family… we’re hiring! 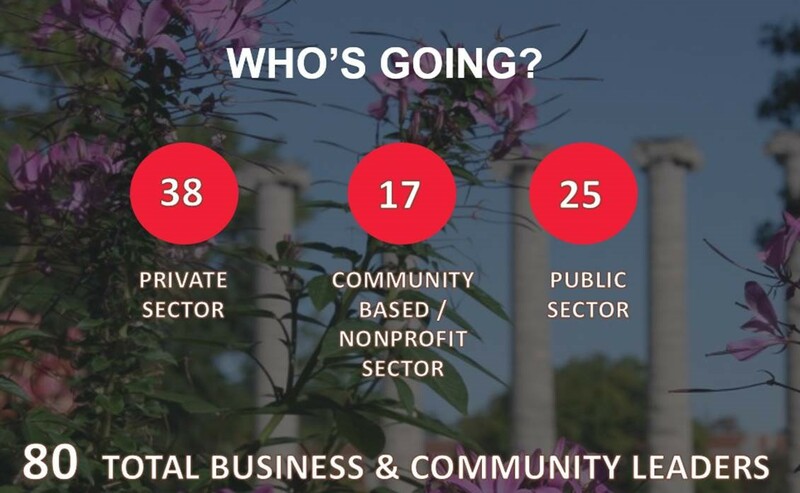 This weekend a delegation of 80 business and community leaders from Greater Mankato will be traveling to Columbia, Missouri as part of the fourth InterCity Leadership Visit. While there the group, made up of individuals from the private, community based, nonprofit and public sectors, will study innovative ideas and best practices that may be adapted to the Greater Mankato region.